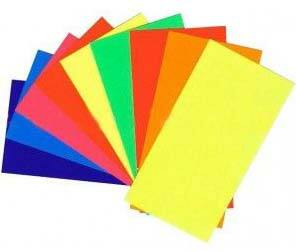 An Exciting Range of Extremely Pure, Dazzling Fluorescent Coloured Paper Ideally Suited for Posters, Point of Sale and Eye-catching Display. Displays and Signage Based Fluorescent Colures On are Guaranteed to Attract More Attention and Create Better Impact Than Those Based On other Surfaces. Fluorescent Colures Has Been Carefully Formulated to Exhibit a Greater Resistance to Fading, While the Strong Base Paper Used Can Withstand Rough Weather Conditions Remarkably Well. Available In Sheets of Different Sizes. Substance : 180, 230, 240 & 250 Gsm.